Complete a free online medical questionnaire. Your questionnaire will be reviewed by a prescriber who will issue a free private prescription the following working day if suitable.Courier Pharmacy dispenses your medication from our Derby based pharmacy. The medication is sent by Royal Mail First Class recorded delivery and usually arrives within two working days. New industry guidelines require the identity of every individual to be verified. Identity solutions create a trusted relationship, allowing you to operate responsibly and minimise the disruption to you.Going forward the prescribing doctor will require patients to upload an up-to-date copy of their medical history as part of the consultation process. We are a fully regulated UK online pharmacy. 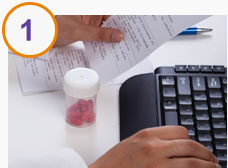 Our service is fast, confidential and safe for all your pharmaceutical needs. We dispense a wide range of competitively priced products for conditions such as erectile dysfunction, weight loss and asthma.